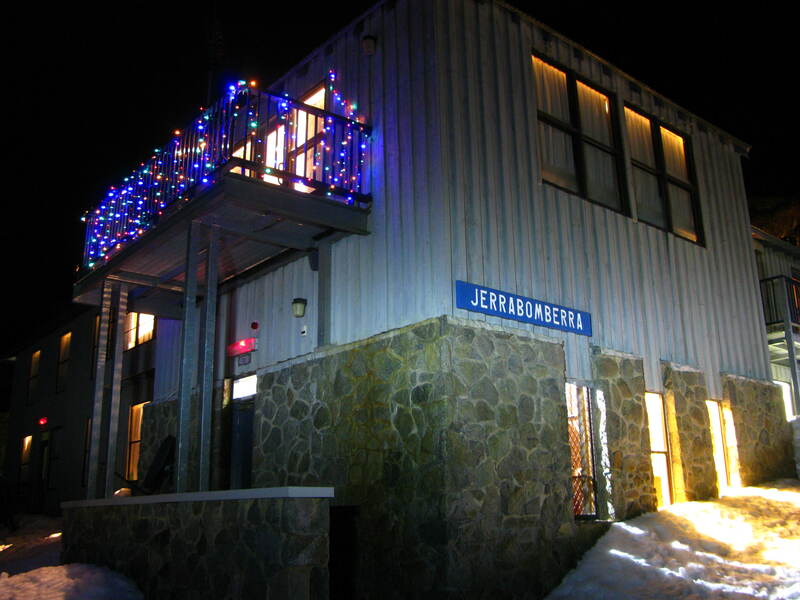 A group of people commenced building Jerrabomberra Ski Lodge in the summer of 1978 in Charlotte Pass. The building was designed and built by David Trinder of Trinder Alpine Constructions. Its style could be described as “Australian Alpine Resort” with some European influences. The cost was $179,000.00. Building the lodge was no easy task. The weather either very hot or very cold, the ground full of large boulders to be excavated and shifted, materials transported a long way off and equipment and skilled labour always difficult to find. The building of Jerrabomberra Lodge showed that many people were confident about skiing in Charlotte Pass and those skiers introduced to the valley added greatly to that existing skiing base who were already enjoying Charlotte Pass up to that time. Jerrabomberra Lodge is a family Ski Lodge with a limited membership of 50 ‘A’ Class Members and 100 ‘B’ Class Members providing Charlotte Pass accommodation. The day to day running of the Lodge is by a contract management team selected on a yearly tender basis. The overall development in the valley has been well planned creating a truly Australian Alpine Village unique to this country. There is something for everyone at Charlotte Pass. MONDAY - Snow Cone Day - every afternoon the kids get a free snow cone. - Freestyle Terrain Park – with jumps, boxes and rails. - Enhances natural Terrain Park. - Kosi Carpet – enabling beginners to access the terrain to advance their skills. - Charlotte Pass Play Park – offers a range of challengers for kids of all levels and ages. From mini jumps to whoop-de-doos and snake trails. Kids will have a great time. - Charlotte Mid Station Coffee Hut. - Snowshoe Lunchtime, Groomers or Mount Stilwell Snow Experience Tours. - Charlotte Pass Gift Shop. - Ski lessons either private or group. When does Jerrabomberra Lodge open. The Lodge opens its doors on Saturday 23rd June, 2018. How close is the lodge to the slopes, lifts, and ski hire of Charlotte Pass? Jerrabomberra Lodge is within walking distance – you can ski from the lodge to the lifts and back. How are the rooms at Jerrabomberra Lodge set up? Room allocations are based on availability. The Lodge offers double, family and single rooms. At times there is a need to reallocate rooms prior to arrival. The rooms have various bedding configurations. When booking please advise your details to ensure you are in a room which suits you best. Where can I rent my gear? How can I arrange ski or snowboard lessons at Charlotte Pass? Is there an ATM at Jerrabomberra lodge? There is an Atm available in the Resort. Is it advisable to take out Travel Insurance? Yes, Travel insurance is advisable and is regarded as an essential part of your holiday to potentially protect you against loss of personal belonging, public liabilities and cancellation fees. Can I make phone calls from the lodge? As Charlotte Pass Snow Resort is isolated, mobile phone reception is very limited. The lodge does have a phone. This is a wall phone in the lodge that can be used to make calls. To make calls you need to pre-purchase a phone card or you can ring 1800 reverse. Phone cards need to be purchased before arriving at the Resort. Does Jerrabomberra Lodge have Internet? Yes Wi-Fi access to Internet is available. This is included in your tariff. How do I pay for my drinks at the Bar? Yes. Please refer to the Terms and Conditions. Is there a General store or Gift Shop at Charlotte Pass? The Charlotte Pass General Store offers a great selection of souvenirs, postcards, goggles, sunglasses, groceries, magazines, newspapers, chocolates, soft drinks and alcohol. Do I need to bring a cot or high-chair for by my infant? The lodge can provide a port-a-cot and high chair. Please request this when making your booking. Does the Lodge have a laundry? The Laundry contains 2 coin operated washing machines and 2 coin operated dryers for guests use Monday to Friday. Washing power is provided. There is also an iron and ironing board for guests use. What activities does the lodge have? Theme Night – The theme of which is usually advised to guests either by email or post. It is encouraged that you participate. BBQ – This is usually done outside (pending on the weather) and guests help in setting up, cooking and packing up. Is the bar open at lunch time? If I get hungry during the day is there food at the lodge? Yes. There is self service tea, coffee facilities, biscuits and fresh fruit provided. Will my skis, stocks and board be safe? Where do I dry all my wet clothing? As you come off the slopes and into the lodge there is a large heated drying room to accommodate guest's gear. Do I need to bring any towels, linen or blankets? No these are all supplied. Is there a Doctor at Charlotte Pass? No. The Lodge is a smoke free environment. Can you toboggan at the Resort? If I have a concern during my stay who do I address this concern to? Each week there is a nominated Club Captain appointed to address any concerns. Where can I rent my ski gear? How can I arrange ski lessons at Charlotte Pass? What are the costs of lift tickets at Charlotte Pass? Charlotte Pass Snow Resort will be decorated with tinsel and Christmas trees on the 21-27 of July. Events and activities include snowman-building competition, best decorated lodge, snow photo with Santa. Get into the Christmas spirit. Keep your eyes out for Santa. *The Jerra kids took on the other valley kids in a very large snowball fight which lasted all week. And also when the adults ended up in the snowball fight too. And this tradition continues each season. *Your kids had their first day on the snow. *Halley’s Comet was viewed from Charlotte Pass. *It snowed on the Anzac Day working bee weekend and 2 tone of firewood had to be dug out and stored under the lodge. *You would be the designated cowbell ringer on race day. Jerrabomberra Lodge is in the ski fields at Charlotte Pass Village in the beautiful Snowy Mountains so you can “ski in and ski out”. It is a dream for skiers, snow boarders, walkers and cross-county enthusiasts to explore the beginner, intermediate and extreme slopes from Kangaroo Ridge to Guthrie’s’ Chutes. The Lodge accommodates 30 guests for families, couples and singles and is fully licensed. The rooms vary in size from Double Rooms to Family Rooms (for up to 5 persons) each having their own ensuite with heated floors, wall heating and all linen is provided. It will be cold!!! So be prepared. Layers are the best way to go. The Lodge is warm and comfortable so pack casual warm clothing for the day if you are not skiing. At nighttime dress is smart casual. Jerrabomberra Lodge will NOT be held responsible for costs, loss of deposit and final payments made or other fees incurred due to cancellations resulting in unforeseen circumstances, medical conditions or changes to your travel plans. Jerrabomberra does NOT offer an “On Snow Guarantee”. Under no circumstances can Jerrabomberra Lodge be held responsible for no snow or weather conditions. The Ski-tube is a convenient train ride from Bullocks Flat through the mountain tunnel to Perisher Valley Terminal in 15 minutes. There's also FREE day and overnight parking at Bullocks Flat. Your Charlotte Pass experience starts at the Guest Services Office. This is located in the Perisher Valley Ski tube Terminal, at the far end of the ground floor of the Terminal building. This is where the Charlotte Pass Over Snow Transport departs from. From there you board one of the state of the art Over Snow vehicles and take a scenic trip through the main range to Charlotte Pass. OVER SNOW TRANSPORT - VERY IMPORTANT – Your Over snow Transport can be booked by calling 02 6457 5315. The 2018 Return Over Snow for an adult (14 yrs. and over) is $105.00, for a child $85.00. One Way Over Snow for an adult (14 yrs. and over) is $70.00, for a child $60.00. Please choose your times carefully with booking your oversnow transport as changes incur a $5 fee per ticket. • one snowboard. Additional costs apply to excess baggage. Please note that you should be ready for your Charlotte Pass Over Snow Transport to and from the Village at least 15 minutes prior to the scheduled departure time. If you miss your ticketed departure times then you will have to wait for the next available Charlotte Pass Over Snow Transport, which could result in lengthy delays. The staff are very welcoming and will provide you with great and helpful service and contribute to a friendly and comfortable stay at Jerrabomberra. There is a Lodge Manager, an experienced Chef as well as support to make you welcome and your stay comfortable. This is included in your Rates. The lodge is very comfortable. You do not need to provide any linen; the beds are comfortable with quilts, blankets, towels and pillows. The bathrooms have heated floors and hairdryers are provided. There is a laundry with 2 washing machines and 2 dryers. They are coin operated and take 2 x $2 coins. Washing powder is provided. There is an iron and ironing board available. Downstairs when you come in off the snow there is the drying room. It is a reasonable size but as you can imagine it gets very crowded. The aim is to try and keep all your gear together. If possible please mark your clothing with your name so that it won’t go missing. There is a sauna downstairs in the Lodge so if you want to use it pack your swimming costume. Included in your accommodation are 3 meals per day. Times will be confirmed on arrival. There are coffee, tea and hot chocolate making facilities (all provided) as well as a microwave and toaster. If you wish to take down any snacks you are more than welcome too. In the interests of all Members and Guests please leave the kitchen area tidy, wash and dry up your cups and dispose of all rubbish in the bins provided. Lunch on the Saturday of your departure is not included in your tariff. However if you wish to stay a charge of $10.00 per person is required. Please let the Managers know if you wish to stay for lunch on the Saturday. Jerrabomberra Lodge is a very popular and busy Lodge and the food that is produced for our Guests is nutritious and very wholesome. The Lodge is not a Restaurant!! For obvious operational reasons the menus are prepared on a reoccurring basis for such a large group (30+ guests and children) and does not provide for a choice of meals. Our Staff work very hard and fast in the kitchen to ensure that the vast majority of our great meals are delivered on time. There is very little time to cater for differing diets, not only because of the time constraints but because the Lodge is isolated and special dietary needs are difficult and (often) expensive to source from suppliers. Therefore, Members and Guests with dietary requirements are requested to carefully consider their position before making a Booking, in light of the possibility that the established menus may not be suitable or coincide with their dietary needs. The bar is open during lunch and it is open again from 5pm till 10pm. It is customary to open a “bar tab” for the week and this is to be finalised and paid for on the Friday evening before departure either by cash or eftpos. As per the Booking Terms and Conditions, Jerrabomberra Lodge is a licensed premises. If you wish to bring your own wine/or spirits, an Alcohol Surcharge will be applicable. In all instances we have endeavored to keep the bar prices at a minimum to encourage Members and Guests to use the bar. Surcharge prices: Wine $5.00 per bottle, Spirits $20.00 per bottle. There is no smoking allowed anywhere within the Lodge. This is for the safety, comfort and health of our guests. You are allowed to smoke outside but 4m away from any opening door. Please dispose of your butts in the garbage bin. There is a TV and DVD player in the lodge together with a stereo. There is a good choice of DVD’s and music and stocked bookshelf. There are also board games. Feel free to bring with you decks of cards or any other games or DVD’s. There is usually a Theme Night during the week. Your Club Captain will decide on a theme and will advise you of this. The BBQ day – the day for this is to be decided upon and it also depends on the weather. The staff will provide all the food and salads. Help is required in setting up the BBQ, tables and chairs, the cooking and the packing away of the BBQ, etc. The Standard Race – this is held on Thursday and we encourage you to participate in this fun event. Your Club Captain will provide details. Touring – If you are going cross-country skiing or on a day tour into Perisher could you please let another member or guest know. Snacks to munch on whilst you are skiing or even give to the lifties while you are waiting in the lift queue. Relax by the roaring fire after a hard day of skiing, boarding or cross-country on the mountain, make new friends over a cocktail at the bar, read a book, play a game of Monopoly and enjoy what Jerrabomberra Lodge has to offer. Have Fun!! Enjoy and happy skiing!! Regional Express (Rex), in partnership with Snowy Mountains Airport Corporation Pty Ltd(SMAC), has today announced that it will commence Regular Public Transport (RPT)services between Sydney and the Snowy Mountains (Cooma) in March 2016. Services will commence from Wednesday 23 March 2016 for the Easter period, with the core schedule of five return services per week commencing from Monday 28 March 2016. Additional services on Fridays, Saturdays, Sundays and Mondays will operate through the ski season. The Snowy Mountains region has been without RPT air services since mid December 2013 when the prior operator Brindabella Airlines was placed into receivership. This is not the first time that Rex has operated RPT services to the Snowy Mountains. Rex operated services to the region for three years until the severe worldwide pilot shortage of 2007/08 forced Rex to suspend a number of services across its network. The Regional Express Group formed the Australian Airline Pilot Academy (AAPA), its pilot training facility based in Wagga Wagga, to combat this issue. Chairman of Snowy Mountains Airport Corporation, Kevin Blyton is delighted that Snowy Mountains Airport will again welcome Rex to the region. "Rex delivered a very reliable and safe service in the past and the resumption of regular year round flights to and from Sydney provides an important link for the people of the Snowy Mountains.”"We look forward to working with Rex in providing the best possible air service to satisfy the needs of both the business and tourism sectors for many years to come,” he added. The services will be operated by Rex's fleet of 34-seat Saab 340 aircraft and fares start at $149 each way (plus a booking/services surcharge). We are on our way again! The next phase of the history of Jerrabomberra Lodge will now run from 2018 to 2058 but I dare say I and many of our early members won’t make it all the way there. However, it will be nicely set up for those who do follow us. What a relief to know that we have finally reached the end of the Lease renewal saga and that the outcome is as we would have wished for. I believe that the saga has been going for over seven years for the owner (Kevin Blyton and team) of our head lease so they must also be congratulated on their determination and persistence in obtaining a favourable and secure outcome. I am sure it has taken its toll of people’s health, that is those that have been closely involved, as the whole saga appeared to be quite convoluted and must at times been quite stressful and political. Who can remember those famous words from one of our illustrious leaders, “Life wasn’t meant to be easy”. That appeared to be certainly true in this case. We can now look forward to a period of certainty and constructive evolution of the Charlotte Pass ski field, subject to development approvals where required. Whilst some maintenance work was carried out by CPV during this intervening period there was no real serious investment in CPV warranted. Our board felt a similar sentiment but now it’s all hands-on deck and as you can see from the pics taken earlier this year by our Maintenance Director, Phil Clisby, the lodge is already beginning to show signs of its new look. MAINTENANCE- This summer season saw many separate visits and several working bees organised by Phil and he and his team have been extremely busy. As reported by Ron Green the refurbishment works were only commenced on confirmation of the lease. Many members have contributed to various elements at the working bees this past summer. Ron also reported that the roof has now been replaced and 25% of the new windows installed including a new and better insulated window and door from the lounge to the existing deck. Additionally, access doors and frames were renewed and another big job was the enclosing of the street side veranda to protect it from the incursion of the snow build up that is created by the groomers when working on the back street. The renewal of the seal over this veranda floor was a regular annual task and was needed to prevent moisture getting into the store room where we keep our seasons’ provisions. Closing in the veranda will provide a more permanent protection and will also be environmentally advantageous in helping to retain the warmth within the lodge, so helping reduce our environmental impact on energy usage and help us to better comply with the environmental conditions of the lease. Next summer is all about renovating the outside of the lodge with more thermally efficient façade cladding and replacing the remainder of the windows with new double-glazed ones. There will also be the opportunity, with the window replacement, to install thermally efficient opening windows in the lounge to allow access to and done concurrently with the build of the new balcony off the lounge (west side). Any members who can offer their help next summer will be appreciated. There is always plenty to do to get the lodge functional and comfortable for the 2019 season. Call Phil Clisby our maintenance officer on 0413 735 624 to lodge your expression of interests if you think you might have some time available. It’s not a firm commitment but being on Phil’s list does help him schedule what gets done when. WHAT DOES THE FUTURE HOLD?- CPV management has told us that they now have a ten-year plan of improvement and changes that will help make CPV an even more desirable resort for family skiing over the years to come. As some of these will need Development approval there is no knowing when that might occur or what particular season they will be ready for. However, a renewed sense of optimism is now in the air! Some of the improvements that have already happened are to the infrastructure that we don’t often think about. Improving the reliability of the sewerage plant, maintaining the over snow vehicles to ensure that the weekend transport schedules are met without breakdowns and riders on the chair will see a renovated top station for the happy lifties. The ski hire equipment which was pretty good last year has been further improved and more investment made in it whilst the ever-necessary snow making equipment has been added to. Christine Parker at CPV did say that this year there will be NO TOBOGANING ALLOWED. In fact, don’t even take a toboggan as it won’t be loaded on the over snow transport. If you have one stored away don’t get it out as it will be confiscated. It seems the same restrictions now apply at Thredbo and in many parts of Perisher, so be warned. However, Christine said to remember that the warm hospitality in the Adams Bar and the 5pm Piano bar sessions is still available for valley guests. This year members will be without the availability of Stillwell’s hospitality. The cappuccinos and hot chocolates on the terrace in the sun were to die for but unfortunately Stillwell did not renew its lease and the property will revert to the CPV for future accommodation, so this year it is closed. Looking ahead, members will certainly benefit from the planned investments to come in CPV over the next ten years. When implemented these can only be positive for the success of the resort and will make it more attractive to even more potential members and guests, to the benefit of the lodges in the valley. NEWSLETTER - I was recently asked about our Newsletter frequency of publication which used to be 2-3 times per year. Well I am sure you can understand that there was not a lot to write about until the lease matter was sorted out one way or another. In fact, there was a period there, due to the delays, that accommodation bookings were not able to be confirmed for 2018 and we were advised by NPWS to just to place people on a Wait List until it was resolved! 2018 MANAGERS- Just referring back to the delay on the lease finalisation. The indecision on the lease outcome was also a delaying factor in confirming the hire of our 2018 season managers. Both Chris and Bianca who had managed Jerra for the last three years had indicated an interest in returning once again but after tying the knot finally in November 2017 and having an uncertain future ahead of them decided on an alternative course of action and will not be returning to manage Jerra in 2018. As you can imagine, this created yet another problem for our operations team headed by Ivan Bradshaw. It demanded an extra amount of time and effort to attract, vet, background and negotiate agreeable terms from the several contenders. It had to be done in a very short timeframe. Thankfully Ivan has advised that a team has been contracted and he will be providing even more of his time onsite to work with them in the first operational weeks to ensure they are fully trained in all aspects of the lodge’s management and operation. I am sure we often forget what is needed to make the lodge run smoothly and the extra demands placed on the few relevant board members to achieve the desired outcome, to please all members when staying at Jerra. I can confirm that it does not happen magically by osmosis. Our joint manager’s for 2018 are Sujin Park and Tommy Robinson with Dan Tull cooking up a storm. Sujin has been working in the hospitality industry for 9 years and this will be her 2nd year at Charlotte Pass. Previously she was at Stillwell Lodge as a Maitre D. Sujin has also managed on Fitzroy Island and in the Sydney CBD. Sujin and Tommy worked together on Lord Howe Island. Tommy has 6 years of experience in the hospitality industry and this will be his 4th year at Charlotte Pass. Tommy was the Bar Manager at the Chalet for two years as well as Restaurant Supervisor on Fitzroy Island. Dan has had several years’ experience as a chef and some years ago worked at Stillwell Lodge. He has worked in New Zealand and Japan doing winter seasons back to back, so you know he loves the snow. It’s a new team for us but comes with great experience of the type of needs of skiers so the results should be spot on. Looking ahead to this season…..
At this late stage the most available accommodation is during the first three weeks and last 2 weeks of the season as the lodge is fully booked in the other weeks now and accommodation is being taken up as we speak. So if you are still thinking but not acting then get a move on! You can contact our booking officer Rose Leishman on 0408 186 296. If you were at Jerra late in the 2017 season then you would have enjoyed some of the best snow and it was even better when CPV had closed and continued into October when it was deeper than 2. 25 meters. ** So this year CPV have announced that the 2018 ski season at Charlotte Pass Snow Resort has been EXTENDED to Sunday 30th September, 2018. SCHOOL HOLIDAYS - This year the NSW public school term finishes on Friday 28th September so I can foresee a few eager parents already looking at their diaries!!! However, they may have get in quick as Queenslanders will have a week's start on NSW parents. Their school term finishes on Friday 21st September. Private schools usually finish up a week earlier. As this is the first time that CPV has stayed open and due to the late news Jerrabomberra Lodge will accommodate Members/Guests from Saturday 15th September to Saturday 29th September, if Members/Guests wish to take up the offer for accommodation, with some conditions. 5. You understand the 2018 Booking Terms & Conditions. Please ensure that you understand the Cancellation Policy in the Booking Terms & Conditions. THE LEVY– The board has been pleasantly surprised by the response from members to Ron Green’s letters advising us all of the financial requirements needed to continue on with the lease. Thankfully the amount to be levied was foreseen eight years ago and was correctly quantified to the membership at that time. We see the level of acceptance to support the size and timing of the levy as a very strong indication of the members’ satisfaction of the decisions taken by the board in this matter and thank members for their continued confidence in the Board as we go forward. I think one very gratifying point that is worth mentioning is that over this time inflation, as measured by the CPI, would have seen this sum to have increased. Even the basket of goods and services used for calculating the CPI and then valued at $3000 would cost at least $3650 today, so holding the levy at the forecast level is yet another practical indication of the strong financial management of the board. Another measure as to how well the financial management has been can perhaps be ascertained when viewed against the sort of levy that a nearby lodge is asking for their husband and wife members. It seems that it is almost three (3) times more, as was reported to me! It makes the Jerra levy look almost miniscule. Ok, I think that’s it from all of us putting this together. Thanks to Phil, Rose and Ivan for their inputs and many thanks to the Lease team for getting us to this point. We can now look forward with certainty to many years of bright and happy stays at Jerrabomberra and enhanced skiing in CPV.